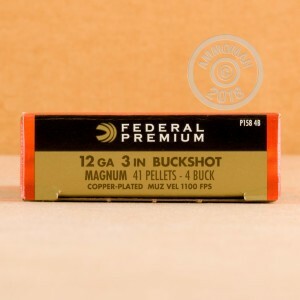 These 12 Gauge Buckshot rounds from Federal are a hard hitting option for deer hunters. Federal's Vital-Shok shells utilize a spiral stacking process paired with a short cup, plastic wad to help deliver very dense patterns and hard hitting knock down power. These 3" hulls hold 41 copper-plated #4 pellets that leave the muzzle at 1,100 feet per second. Federal Premium Ammunition was established in 1922 and believes that "Every shot counts." There ammo is made in America at their Anoka, Minnesota facility. Federal is part of Vista Outdoor who owns several big name ammo manufactures. 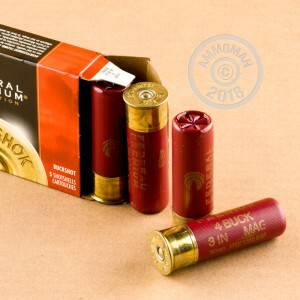 The Vital-Shok line is aimed at providing a premium level hunting round at an affordable price. Need more than 5 rounds? At AmmoMan.com, all orders of $99 receive free shipping!